Cricketing superstar, Darren Gough, has taken to two wheels with the same enthusiasm and dedication that saw him become one of England’s most successful wicket takers of recent times. The former International cricketer has attracted a legion of new fans in the recent past having won the BBC’s hugely popular Strictly Come Dancing on two occasions, once as series winner and then again as overall victor in a Christmas special. Having decided to take to two wheels, 40 year old Gough teamed up with the Motorcycle Industry Association’s GetOn campaign, an initiative designed to attract new riders to motorcycles and scooters and guide them through all aspects of machine choice, appropriate clothing, insurance, finance and training. 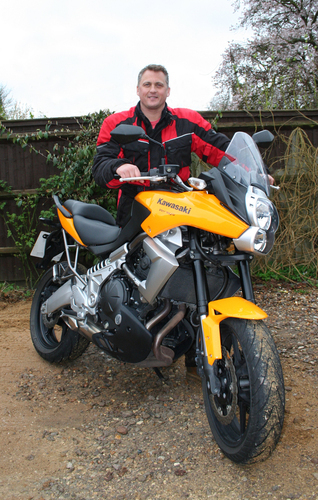 Choosing the same machine as that of his riding instructor, Gough has now taken delivery of a 650cc Kawasaki Versys for which he already has ambitious plans.